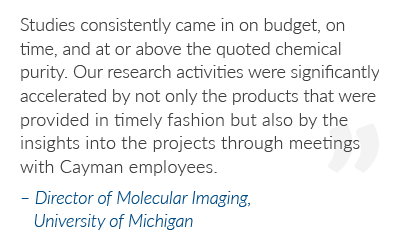 Cayman Contract Services provides discovery and pre-clinical development services to the global pharmaceutical, biotechnology, and academic research markets. Our diverse suite of services leverages a team of over 150 highly skilled scientists with expertise in medicinal chemistry, structure-based drug design, complex multi-step organic synthesis, analytical chemistry, sample analysis, and custom assay development. We offer a personalized, flexible approach that enables our clients to accelerate their drug discovery and development through a single-source partner, from novel drug design and synthesis to target identification and validation. Maintain complete control of your study with phase-based, flexible project design. Consult with our cross-functional team of scientists with expertise in diverse research areas and technical skill sets. Access our state-of-the-art laboratories with dedicated resources to support your project needs. 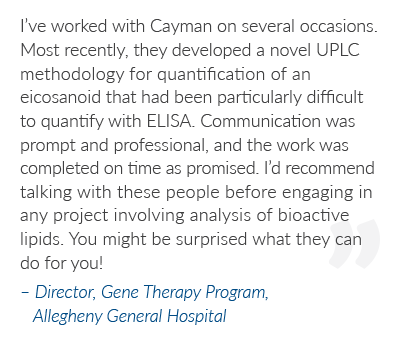 Cayman’s Bioanalytical Division offers a wide range of services to accelerate discovery and pre-clinical development initiatives. Our scientific staff has decades of industry expertise in assay and methods development, sample preparation, and analysis. We consult with you from project kickoff to conclusion on experimental design and data analysis to ensure you meet your objectives. Select from our catalog of well-characterized assays, qualified commercially available assays, or let our experts design a custom assay that suits your specific requirements. Our team regularly develops plate-based, mass spectrometry-based, cell-based, and flow cytometry assays. If you require a CDA before disclosing project details, check the “CDA required” box below. 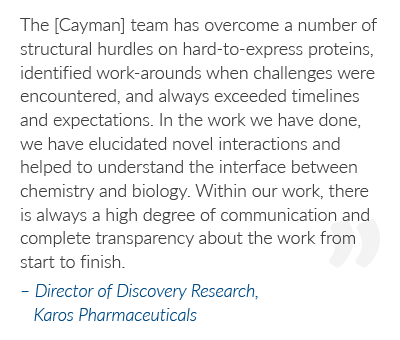 The Medicinal Chemistry and Structural Biology groups at Cayman have successfully delivered on a wide range of external drug development programs and driven independent and collaborative external and internal programs. This service offers a fully integrated multidisciplinary approach from design and synthesis to screening and optimization. Scale-up and process/GMP development are also offered. Whether it’s lead generation or optimization, route and methods development, screening, or scale-up, Cayman’s experienced medicinal and organic chemists, structural biologists, and biochemists possess the competencies to augment your pre-clinical drug discovery and development needs. To help us better understand your project, please submit any relevant compound or scaffold structures. If you require a CDA before disclosing details, check the “CDA required” box below. 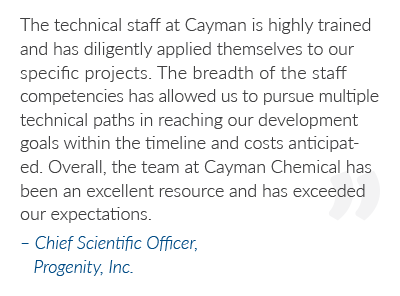 Our scientists perform routine quality control testing on thousands of compounds each year, giving Cayman unparalleled expertise in the development and validation of methods to analyze, quantify, and purify small molecules. Employing multiple chemical testing methods customized to each project’s unique requirements, we perform qualitative and quantitative analysis, purification, and characterization of chemical entities such as bioactive lipids, natural products, synthetic compounds, cosmetics, pharmaceuticals, and drugs of abuse in organic and biological matrices. If you require a CDA before disclosing details, check the “CDA required” box below. Our team of synthetic organic and medicinal chemists brings decades of academic and pharmaceutical experience to perform complex, multi-step organic syntheses. Supported by our Medicinal Chemistry & Structure-Based Drug Design and GMP & Process Development Services, our growing team of more than 70 highly skilled organic chemists has added broad synthetic proficiencies to our traditional core expertise in lipid, bioconjugate, and stable isotope labeling chemistry. We are ready to take on your next challenging project! To ensure accuracy, please submit a structure of the compound(s) you would like to have synthesized. If you require a CDA before disclosing compound details, check the “CDA required” box below. Bioanalysis services for the characterization of peptides associated with the major histocompatibility complex.